High Quality, proven .243 ammunition made by the premier American producer over the years for hunting cartridges: Winchester. 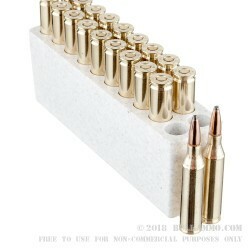 This .243 Winchester ammunition is loaded with a 100 grain soft point projectile combines a premium brass cartridge case which is boxer primed, and very high quality powders to create a remarkably consistent cartridge that has been used to hunt medium and large game for many decades. 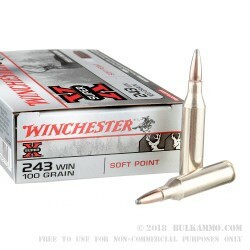 This particular cartridge has been proven to perform in the field for years as the premium mainstream .243 round offered by Winchester. 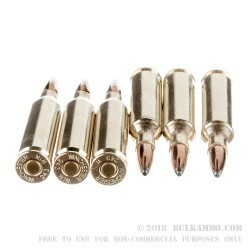 The “Power Point”, soft point, pointed projectile is a projectile of 100 grains that moves out of the barrel at 2960 feet per second (muzzle velocity), and with a delivery of 1940 foot pounds of energy out of the barrel. For medium game like small deer, or even larger game these ballistics are sufficient to produce ethical kills on a variety of animals. 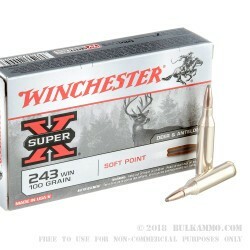 The .243 is a mildly recoiling rifle round considering the velocity and energy of the round and the Super-X load is a particularly good example of a hard hitting, moderate recoiling cartridge that is perfect for follow up shots if needed, or for comfort in the field.